Sony’s Tablet S might not be the most popular tablet out there, but it is now one of the select few running Android 4.0 Ice Cream Sandwich. 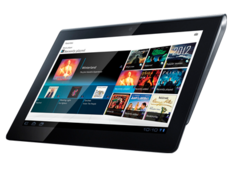 In an announcement today, Sony unveiled that their Tablet S will be receiving an Android 4.0 update over the air and users can immediately upgrade their tablet by connecting to a wireless network. The update itself is pretty close to stock Android 4.0, but features custom Sony tweaks like the ability to multi-task “small apps” (Calculator, Browser, Remote Control) that can be opened in small windows and moved around the screen. In addition, Sony has a couple other tricks they’re using in order to entice customers to purchase their Tablet S. Starting from today till the 12th of May; users who purchase a Tablet S will receive an instant $50 rebate as well as a free cradle accessory. As such, the 16GB version comes out to $349 and the 32GB version is now $449.